Last winter, there were about 300 muskoxen at Dovrefjell, a mountain range in central Norway. This year, the Norwegian Nature Inspectorate counted only 206 animals. This means that one third of the population disappeared within one year. Investigations revealed that the animals died of pneumonia from a particular type of bacteria derived from sheep. During August and September 40 dead muskoxen were found, and several sick animals had to be killed. It was mostly calves and young animals that were affected. 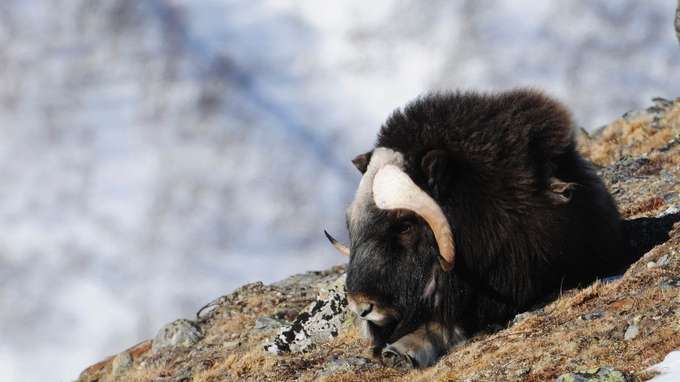 A total of approximately 50 muskoxen died, but now after counting the number is probably twice as high, says Tord Bretten by Norwegian Nature Inspectorate. – The muskox population is probably safe, if this only happens once. But if we get several years of an epidemic that we had this fall then the whole Dovrefjell population will be in danger, says Bretten. The muskox originates from Arctic Canada, Greenland and Alaska. The Alaskan population was wiped out in the late 1800’s. 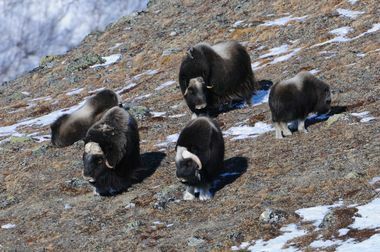 The muskox has since been reintroduced to Alaska. It has also been imported to Northern Europe, including Norway and Russia. The muskox came to Norway in 1931 from Greenland. They were close to extinction, but the number of animals has risen after hunting has been banned. In 1999, the world population was estimated to be between 65 000 and 85 000 – and rising. In addition to diseases, some muskoxen are killed by train on the Dovre Line. Muskoxen can be perceived as calm and harmless, but can also be very dangerous to humans. In 1994, a man was gored to death by a muskox in Åmotsdalen. Hikers are advised to keep a distance of at least 700 feet (200 m) to these beautiful animals.